Your good name will always be associated with good brew, thanks to our personalized pitcher and pint glass set with the eye-catching "Tavern" logo. Before friends pour and enjoy a frosty serving from pitcher to pint glass, they'll know their in good company with the saying "Good Times - Good Friends - Cold Beer". Brand yourself as the ultimate beermeister! 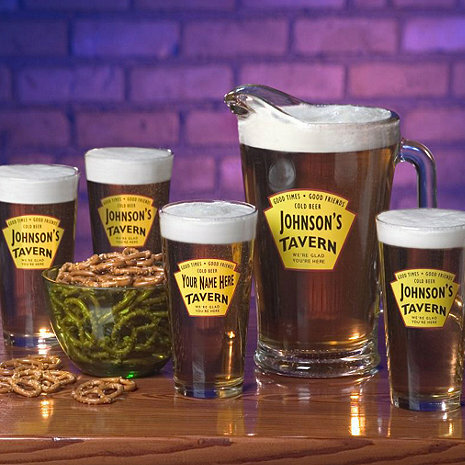 Your good name will always be associated with good brew, thanks to our personalized pitcher and pint glass set with the eye-catching "Tavern" logo. Before friends pour and enjoy a frosty serving from pitcher to pint glass, they'll know their in good company with the saying "Good Times - Good Friends - Cold Beer" above your Tavern name and "We're glad, you're here", the tagline below your tavern name. Machine made of lead-free glass, decal contains some lead. Recommend to hand wash. Size: Pint Glasses - 5-3/4"H, 16 oz. ea. ; Pitcher - 8-3/4"H, 60 oz. How can I get additional matching glasses? Thank you Sarah! OI found it right after I sent the email. Thanks again! These personalized glasses and pitcher are a great unique gift! Great for a Beer Lover! Came as promised and looked great. Didn't see any defects. Great gift for a beer lover! This was given as a Christmas gift and it was well worth the wait. Receiver was so happy and is enjoying the gift with his friends. Who wouldn't love to have their name on their glasses, especially when serving an ice cold beer to guests. The Personalized Tavern glasses have been a huge hit all the way from the first set to the eighth set. Great for Christmas gifts, birthday, wedding or anniversary.